The recipe requires a few steps, but it came together quickly after I got the bacon cooking in my new cast iron skillet. I did have to cook everything for a bit longer than the recipe notes stated since the bacon burned when I tried cooking it over medium-high heat. I substituted ginger powder for fresh ginger, and red poblano peppers for the Thai chilis Peggy used. Instead of “sweet chili sauce,” I used a hot chili sauce I found in the Asian section of the grocery store that has 0 grams of carbohydrates according to the label. Any chili sauce that contains garlic and rice vinegar in the ingredients will do the job. I added erythritol and a pinch of stevia to the hot chili sauce to create my own sweet chili sauce in a pinch. You can use any sugar-free sweetener you like here. Finally, I’d recommend you stick to the amount of bacon grease she uses here (1 tablespoon) instead of leaving extra in the pan, thinking that more fat equals more flavor. As delicious as bacon grease is, the taste of the green beans can become too oily rather quickly, especially if you top the dish with a drizzle of sesame oil. Strain and save that extra bacon grease in a cup for frying eggs! Bring a large pot of salted water to a boil. Add green beans and cook for 4-5 minutes, or until beans are a bright green. Drain and set aside. In a large skillet over medium heat, cook the bacon until crisp, about 6 to 8 minutes. Drain on paper towel-lined plate and set aside. Remove all but 1 tablespoon of the bacon grease from the pan. Add onion, and cook until softened, about 5 minutes. Stir in the ginger, minced pepper, chili sauce, fish sauce, and water. Add green beans and toss to coat. Saute for 8-10 minutes, until water evaporates, the sauce thickens, and the beans become tender. Stir in bacon and garnish plated green beans with sesame oil and a sprinkle of sesame seeds, if desired. I made this dish as a newly inducted member of the Secret Recipes Club! « Sugar-Free Vanilla Ice Cream + the Comprehensive Alternative Sweeteners Information Post! This sounds delicious, regardless of how healthy it is! Bring on the bacon! Looks like a great way to enjoy green beans. Ahh, perfect choice! And thanks for the heads up on the directions – I edited them to say medium to medium high heat (everybody's stoves are different) so that burning of bacon does not occur any more! Oh yes! Love this dish! Great choice of recipes! This dish looks amazing. 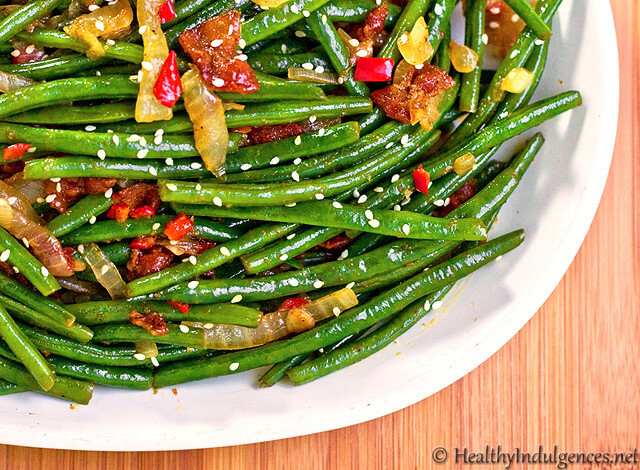 I love green beans and always love to try new ways to make them…especially if it has bacon! Yum. Beautiful picture! The beans look so fresh and crunchy – well done! I love any recipe with bacon on it. Great choice for the club. I've never had the combination of sesame and bacon – sounds interesting! Wow, these look yummy. I have some garden fresh beans in my fridge just waiting for a recipe like this. Thanks. I have an abundance of green beans on hand. This will be a great one to try! I love green beans and this looks like a wonderful treatment for them! plus, it's beautiful in presentation! Can't wait for reveal day for my group next week! Welcome to the SRC! bacon… how can it be bad if it has bacon??? Great job! Have this one bookmarked to try! This just proves it. Everything is better with bacon, even healthy food 😉 Looks amazing! Great pick! It looks so fresh and delicious!!! Good entry for the SRC! What a beautiful dish! I'm sure the bacon makes it great. Nice SRC pick. This looks AWESOME! Gonna bookmark this to make at a later date. Thanks for sharing such a nice and delicious recipe. I like it very much and it seems to be very yummy in taste. Accidentally seared the onions a bit much, but it actually turned out great because they had a slight crisp to them. Matt likes things REALLY spicy, so he added some Sriracha (chili pepper paste, I'm sure you've used or seen it before, way better alternative to Tabasco or Cholula). These are amazing. Totally addictive. Can't wait to make them again. Thanks so much! Looks yum! cant wait to try ithis recipe. mynhusband likesmthings spicy, but turns his nose up at fresh green beans.Have you tried baking your bacon? It’s always perfect. For easier clean up we place our bacon on parchment paper. Trim the parchment paper the size of the pan. 350 oven. Good luck!